First, Let’s Start With A Video. To be successful, timebanks need leadership – or perhaps the better word is “governance.” They need agreements around what’s OK and what’s not OK in relation to earning and spending. To guide those, one additional and most important aspect of timebanking is the core values. 1:1 – One person gives another person a ride to the doctor. 1:Many – A yoga teacher earns credits teaching a yoga class to four other members. Many:1 – Four members earn credits doing a garden clean-up for a senior. Many-Many — A whole lot of people earn credits organizing and participating in a community pet-parade. Let’s take a look at that last many-many example again – the Community Pet Parade. Organizing the Pet Parade could quickly burn up 200+ hours of volunteer time. Question: Who pays out the credits? Answer: An organizational member – like a school, or the timebank itself – could have paid them out. Or (and this hasn’t happened yet – but it could) a timebank could be created for the primary purpose of organizing a pet parade on an annual basis to benefit various causes in the community. Since the parade is a public event, no-one spends any credits to attend. The sponsoring organization gets no time credits in return. But this is not a problem. When community happenings are organized by a sponsoring organizational member or the timebank itself, the time credits paid out to members for their help are seen as a measure of community investment. This time credit “debt” has produced a good for the community! Edgar believed that Timebanking could also play a powerful role in achieving a more equal society. That’s because the “golden rule” of timebanking is this: All hours are equal, regardless of the nature of the act. An hour of baby-sitting earns one time credit. An hour of legal help earns one time credit. An hour of kitchen clean-up earns one time credit. You can take up timebanking in two ways: join a timebank that has already been created – and start giving and receiving services with other members; or form a team to create a new timebank and invite people to join. Edgar Cahn, who founded timebanking, wrote in his book No More Throw-Away People that he was seeking with this new kind of money to foster “decency, caring, and a passion for justice.” That is a huge umbrella, and under it, many things fit. · Strengthened the sense of community. · Improved learning at school. 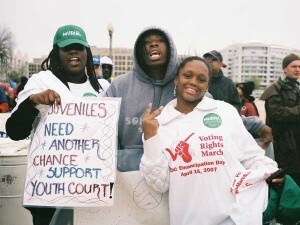 · Reduced the school-to-prison pipeline. · Helped public housing residents save money. · Supported hospital patients as they return to regular life at home. · Brought art and music into a community. · Helped seniors remain at home as they age. Giving, Receiving – Is Each As Good As The Other? The organization that sponsored the parade received hundreds of hours of services from timebank members. It went into “debt.” But this was seen as a plus! Yet consider this: A member gives many services to many other members. She earns a ton of time credits. Then she finds she cannot use the hours that she earned to get help because members don’t respond to her requests. That’s not good. That member will feel that the imbalance between giving and receiving isn’t good: it won’t feel fair. We come with different expectations. We see giving and receiving through different lenses of experience. Some want only to give. Others place more value on what they can get. Some feel it’s wrong if giving and receiving don’t balance out. In real life, the simple equation of 1-1 and that an hour of giving = an hour of receiving can raise deep, unexamined feelings – and when lots of people are involved, that can get complicated! There are numerous timebank software programs available. These include TimeRepublik and hOurWorld’s Time and Talents, and Community Forge. Here at TimeBanks USA, we have designed Community Weaver 3, to help local neighbor-helping-neighbor timebanks get organized. Users tell us they find CW3 easy for time bank members to use. CW3 also has a host of features to help timebank leaders and coordinators encourage giving and receiving through their timebank. If you are interested to see a short video describing CW3’s features, click here. That’s not always easy when people come to relationships of giving and receiving with such different background experiences and varying expectations. You (or your organization or your project) can become a member of an existing timebank if there is one nearby. Search our Community Weaver Directory for Timebanks near you. But that may not work for you. If there is no timebank in place, or if the mission of a timebank near you is different from what you want to achieve, a second option is to create a new timebank. Below is a description of a Neighbor helping Neighbor model. The software provided by TimeBanks USA is called Community Weaver. Among the many others versions of timebanking software are TimeRepublik, Time and Talents, and Community Forge. Many timebanks also use social media and/or a website to complement the timebanking software they use. Orientations may be group or individual. They may be formal, with a set agenda and planned activities, or more informal: sit in a small group, listen to the coordinator describe what it’s all about, learn about the software, and then ask questions. Gatherings work best if they are held regularly so that members can plan for them in their calendar. For many TimeBanks, the pot-lucks are a KEY component, because it’s here that people get to meet and become familiar with other TimeBank members and find out who’s exchanging what. On this front, we are limited “only by our imaginations!” Two great sources of ideas are the Timebank Coordinators Idea Exchange facebook group for timebank coordinators, and the TimeBank Knowledge Commons. Even to say “we will have as few policies as possible” is a policy! 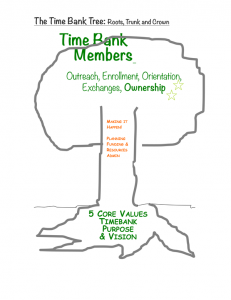 All timebanks share some key elements— but how they put those elements together will depend on the timebank’s purpose, who the members are, and what they do to achieve that purpose. As an example, the Dane County TimeBank in Madison, WI is a Neighor-to-Neighbor timebank. But it also includes a youth court! In contrast, the former DC Youth Court in Washington, DC, (sadly defunded at this time, but seeking to be reborn) was a stand-alone, special purpose timebank. To see a Timebank Youth Court in Action, watch this video. There’s the day-to-day making-it-happen leadership that helps with membership exchanges which is carried by timebank coordinators. Coordinators may be unpaid members of the timebank. They may, alternatively, be paid staff. It takes at least one “people-persons” who will be passionate about connecting people. For example: Member-led Neighbor-Helping-Neighbor timebanks with no paid staff may still find costs rising to $20 or more per member per year. Adding a part-time staff person can quickly lift that amount closer to around $80 per year. And a fully-staffed timebank with a specific focus may cost far more – up to several hundred dollars per member annually. The five value propositions are a good start. But they’re too broad and general by themselves to be more than a rough guide for sustainability purposes. At all levels – from local to regional to national to international – it’s the specifics that count. In what specific ways is their personal and their community’s development supported? And how, specifically? This is true for all levels of the timebanking movement. And yes, it is a challenge. But a good challenge – because, luckily, that’s what timebanking is all about! 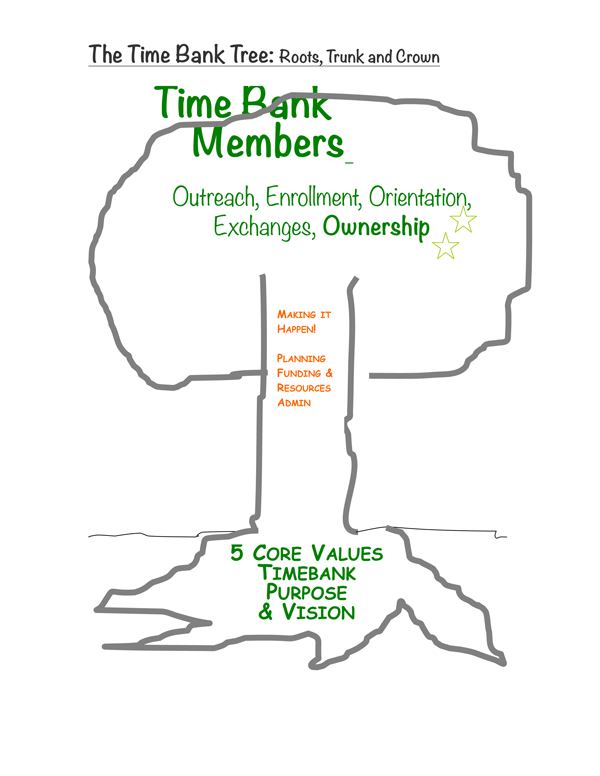 Rooted in community, the timebank’s mission, its members’ desires and passions, and the core values of TimeBanking, timebanks develop in organic, diverse ways. And then there’s the fruit-bearing crown – and all the good things that come out of the members’ actions: potlucks, the exchanges, the orientations. To end, here is the hope that this (somewhat lengthy!) introduction has been helpful, and that your timebanking endeavor – whatever it will be – is beneficial to you and to others, and that over time, it will grow and prosper.